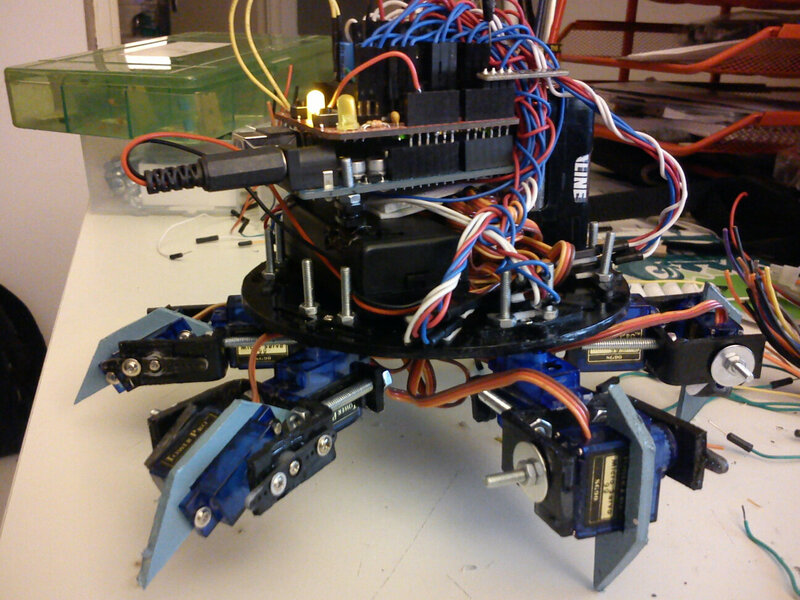 This Simple Hexapod Robot is more like a downgrade from my last robot. The quadruped robot I was trying to build didn’t actually quite work though I spent quite a lot of time, but I have unfortunately underestimated the difficulty. 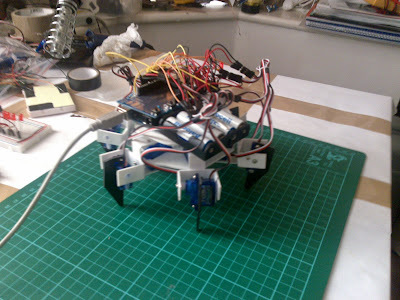 So I am stepping back, and start from something easier, a Simple Hexapod Robot that uses Arduino. I originally thought Hexapod Robot are not easier, as they have 6 legs and therefore more complicated in the programming. It turned out to be wrong because it’s much easier to balance as there are 6 legs. When it’s walking, we don’t need to worry about the center of mass and so on in order to balance, we just need to think about where to place the next leg in order to move. I was controlling the robot via serial cable from the computer, so no controller required. It’s the first time I ever used Styrene plastic and I just in love with it… so flexible, particularly for building small robots like this one. Although it could take a while to cut and get good at it, but it’s definitely a very economic choice for people with small budget! In this one, I basically reused all the servos and parts from the Stalker, the only things I need to rebuild was the robot body and the legs..
See Second Video from the top. The new robot leg design brings better stability because they are tougher and lighter, more importantly it looks cooler! I have also wrote a few more commands files, works quite well ; ) see 3nd video from the top. That’s it! 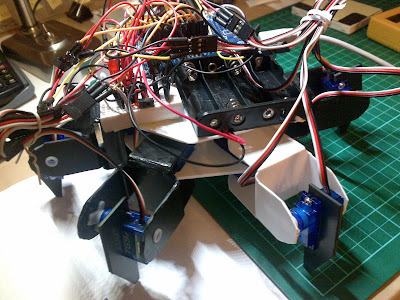 no more simple hexapod robot updates, I will modify it into 3DOF per leg, and start to think about IK and trigonometry! Simple Schematic of the servo, arduino and batter connection. If you want to discuss or share your ideas, just comment down below. Sir. Useful info, I’m studying your info as I am trying to build a hexabot. Lots more to do. 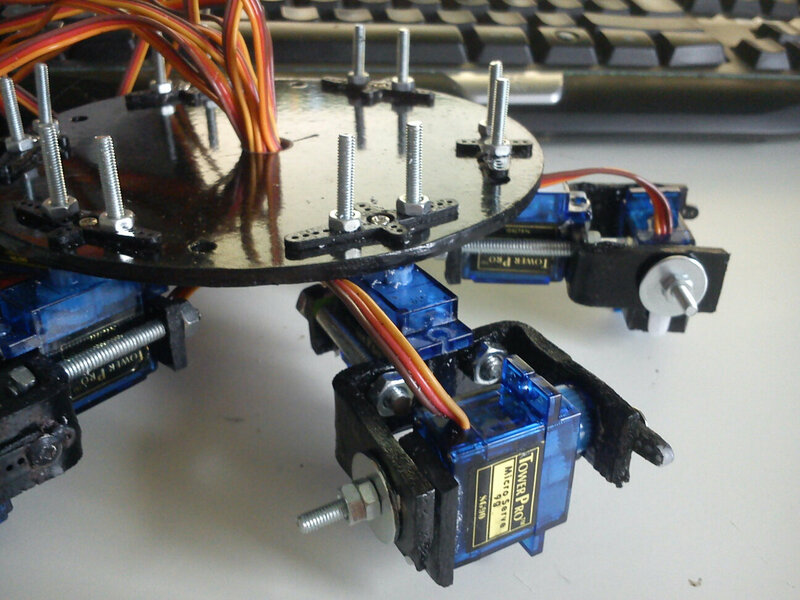 I bought a 3d printer to make parts but it’s a p i t a.
Hi oscar i know its been along time since u made this but could u pls help me with the codeing for 12 servo hexapod like this.i just want it to move forwards with just the arduino code.thx? So cute ! What a very great build you did Oscar !!! how man arduino boards have you used?? looks like 2 in the vid. Thank you for publishing your work. I was wondering what type of connectors are you using to connect all the servos to the Battery Pack? Are there any existing one-to-many connectors? I was trying to avoid building my own customized one. just normal servo pins soldered on the mega extension board. 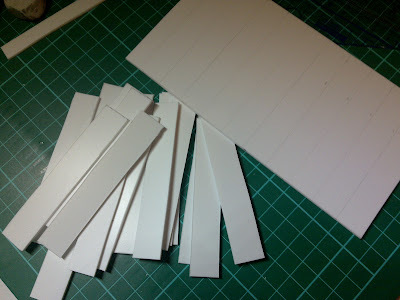 Hi Oscar, loving your work, what thickness styrene do you use for the hexapod? i believe they were 2mm thick. First and foremost I want to thank you for sharing your work, this is really good. 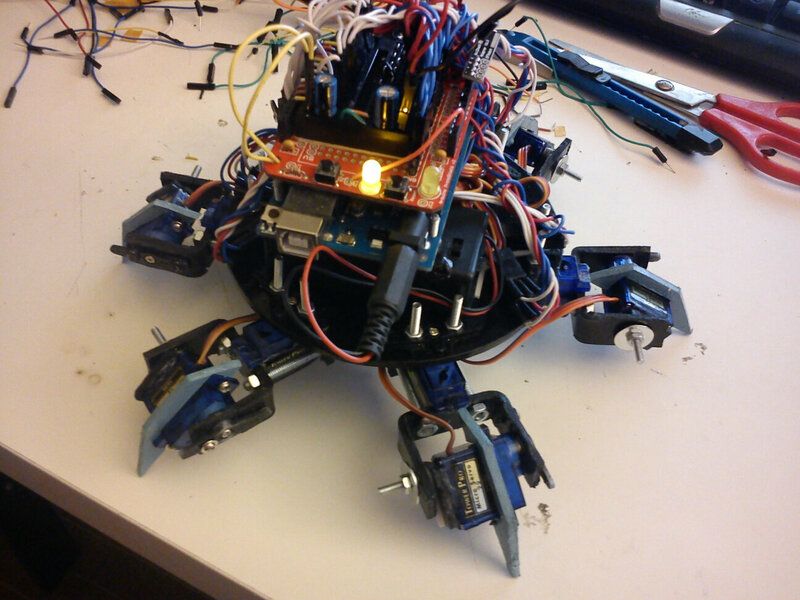 I’m planning to build an hexapod like this one. 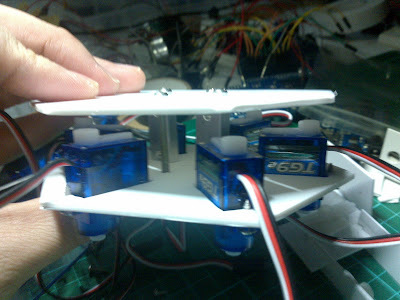 I’ve been reading several forums and powering the servos seems to be an issue, but you just used 4AA batteries and from the videos you posted there was no major problems with the servos, so I wonder if you faced any issue on this area. By the way, did you evaluate to use a servo controller to reduce the number of pins used by the Arduino? Any thoughts on this area? for 12 9g servos, 4 AA batteries are enough. But you might be better off using Lipo because they have larger current output and weights lighter. I don’t see the point of using servo controllers. they are generally over-priced. 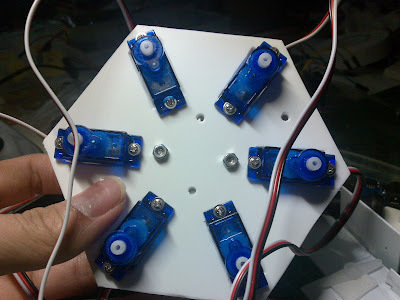 You can totally make a servo shield using standard Arduino Uno Shield and header pins. If you don’t like soldering, you can also use breadboard and some cables. Hi Oscar, after a long vacation, I finally finished the structure of my hexapod, I give you pictures, what do you think? I’ll change the batteries and improve cable management! for programming with Arduino I’m really a beginner, can you help me? because I do not know where to start! I would like to drive with a wii nunchuk. i just replied in the forum. I don’t know if you get notifications when I replied in the forum, can you let me know? 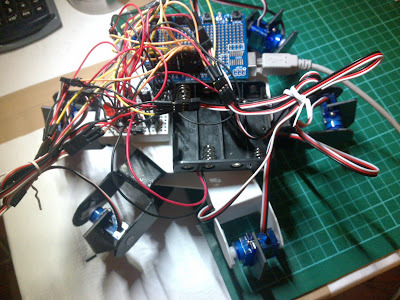 thank you for your answer, yes, my robot has 12 servo (your hexapod inspired me) I’m still down with my machines, so I have not finished the legs ^ ^ I’m a little worried about the future of the programming with the Wii controller, because I am a beginner in Arduino! I congratulate you on your new topics on your blog, they are great! Your cable management skill is much better than mine! very tidy indeed! Oh I see, that’s great! have you got pictures of your structure? hello oscar, how are you since the time? 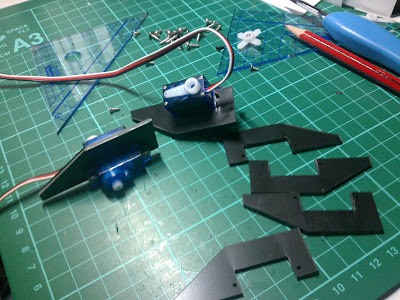 I just made my order for my hexapod I give you news very soon ^ ^! I have been busy with the Raspberry Pi, hopefully I can use it with the Arduino to do more complex projects. But to get started, user control would be useful, to test, understand and correct the movements, before you begin programming complex AI. for 1. there are many tutorials on the internet, you can search it. for 2. it might be a little difficult to understand how Nun-chuck work at first, but once you learned it, you can apply it to many other robot projects as well. Very good connection, that’s what I meant and i think it should work. I have heard about fritzing, it is a good software, i will give it a try next time! 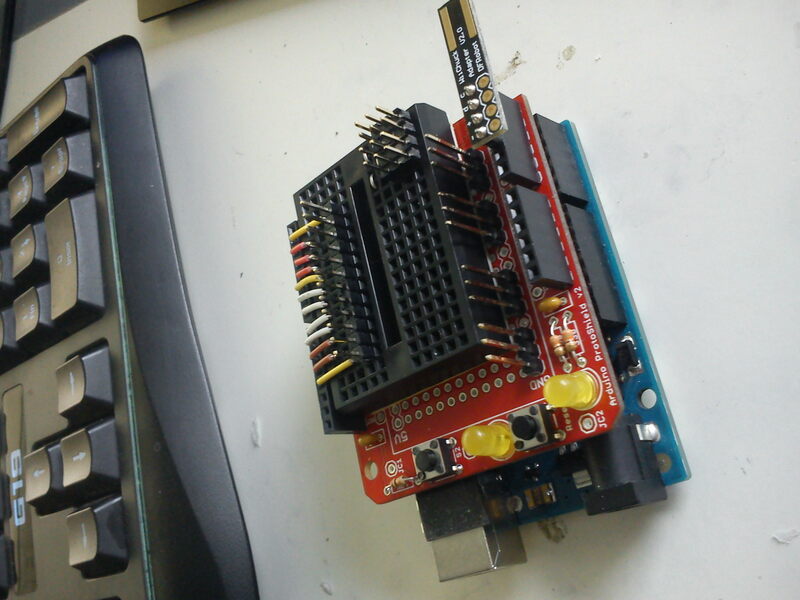 Hi Stephane, any of the pin 1 to 12 can be used to control the servo. the LED is probably a power indicator that I used, not necessary. Sorry for the lack of information about this project, this was my second robot ever so it wasn’t documented properly. 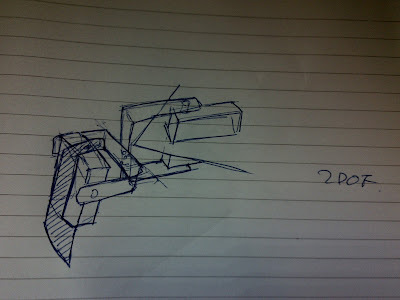 hi oscar, I think your great project for your second robot for my schematic I can send it by email? or another method? for pin I need a pin? and no 12 pin? great, I thank you for your schema I’ll compare it to mine, for my schematic with arduino fritzing I use is a very practical software. The electrical connection is very simple. you are right, I used an Arduino Uno. There is no other cards, but I put a empty shield on top of the Arduino, so I can leave all the connection on the shield and swap the arduino board if I want. this is not necessary. I have 12 servos connected to the Arduino Uno. The Vcc and Gnd of the servo are connected to external power source, e.g. 4 x AA battery. But remember to link the battery ground to your Arduino ground, so the servo understand the signal from the arduino. I also had a couple of large capacitors connected at the power source, to smooth out output current, but this is not really necessary. You might consider adding another 4 x AA battery connected in parallel, so you have the same voltage but more current. Hi Oscar, here is my first drawing, I think I can adruino taken when the robot is disconnect my pc, I do not understand how to connect servo to ardruino mass and external power supply. I saw your picture on it there leds? I connected two servo because we see nothing on the schematic with cables of 12 servos, so if I understand that I do the same for others and I plug the servos on pins 1 to 12 adruino.